Laura Fernández Gallardo studied MSc. Telecommunications Engineering at the University of Granada, Spain, majoring in digital signaling and telecommunication networks. 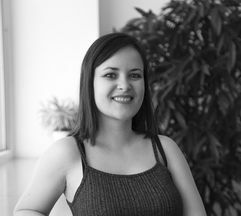 She completed her master’s degree in 2011 and joined the Quality and Usability Lab of Deutsche Telekom Laboratories in Berlin, where she worked as intern during three months. In November 2011, she began working towards her PhD thesis in the domain of speaker recognition in wideband VoIP services. This project was conducted under a research and development agreement between Deutsche Telekom AG, Germany and the University of Canberra, Australia. In June 2015, Laura was awarded the PhD for her work "Human and Automatic Speaker Recognition over Telecommunication Channels", supervised by Prof. Michael Wagner and by Prof. Sebastian Möller. In May 2018, she completed her postdoc DFG project towards the automatic prediction of speaker characteristics over communication channels. This diagram with keywords outlines my research of the last 6 years. (Postdoc) Detection of Persons' Attributions in Speech using the "Nautilus Speaker Characterization (NSC) Corpus"
Usability Engineering (SS 2017): Project: "Evaluating Subjective Person Attributions by Auditory Tests"
Usability Engineering (SS 2016): Project: "Detecting speakers' personality from their voices - Influence of transmission channels"
Zequeira Jiménez, R., Fernández Gallardo, L. and Möller, S., "Influence of Number of Stimuli for Subjective Speech Quality Assessment in Crowdsourcing," Int. Conf. on Quality of Multimedia Experience (QoMEX), 2018. The NSC Corpus recording procedure and material are described. We also present the analysis to derive the five main traits of perceived speaker interpersonal characteristics: warmth, attractiveness, confidence, compliance, and maturity; and the traits of perceived voice characteristics of extreme warm and attractive speakers: For male speech, the dimensions found are: proficiency, tension, melody, brightness; and, for female speech: fluency, brightness, proficiency precision, and shrillness. Zequeira Jiménez, R., Fernández Gallardo, L. and Möller, S., "Outlier Detection vs. Control Questions to ensure reliable results in Crowdsourcing. A Speech Quality Assessment Case Study," HumL@WWW2018, 2018. Zequeira Jiménez, R., Fernández Gallardo, L. and Möller, S., "Environmental Noise Recording as a Quality Control for Crowdsourcing Speech Quality Assessments," Annual German Congress on Acoustics (DAGA), 2018. We have derived five new factors of perceived speaker characteristics by employing the newly compiled NSC Corpus. These factors are warmth, attractiveness, confidence, compliance, and maturity. Analyses of feature importance have revealed that pitch and other spectral features directly extracted from the signals correlate most with the target factor scores. With the gained knowledge of relevant features for each speaker trait, prediction models will be trained and tested in future work pursuing satisfactory speaker characterization performance. We have performed ASR experiments and human intelligibility tests employing degraded speech (transmitted through NB, WB, and SWB channels). We show the correspondence between the obtained scores and the objective speech quality measures POLQA and POLQA-intelligibility, and propose Second-order polynomial fits to predict WER. By auditory tests involving semantic differential, five perceptual factors of speaker characterization have been derived. We offer a discussion on the relations of these dimensions to the Big-Five personality traits. Furthermore, we investigate what speech features are relevant for the automatic prediction of our dimensions and perform SVM regression. We have conducted listening tests to detect subjective speaker likability in laboratory and by employing crowdsourcing (CS). We have examined a pair-comparison approach (see the two publications below for more details) and a direct scaling approach were listeners selected the likability value on a slider. Our results indicate that, while the CS tests were valid for obtaining meaningful speech likability annotations, the CS paired-comparison test can offer more reliable likability scores than the CS scaling test. The results of intelligibility tests under the effects of communication channels are provided. It has been ascertained that It has been ascertained that there exists a strong quadratic correspondence between the subjective and objective intelligibility scores estimated by POLQA and POLQA-intelligibility. Naderi, B., Möller, S., Neubert, F., Höller, V., Köster, F. and Fernández Gallardo, L., "Influence of Environmental Background Noise on Speech Quality Assessments Task in Crowdsourcing Microtask Platform," The Journal of the Acoustical Society of America, 141(5): 3909-3910, 2017. Fernández Gallardo, L. "Sprechererkennung – Auditive Wiedererkennbarkeit bei Breitband-Telefonie," VDE-Dialog, ITG-News. VDE-Verlag, no. 1, pp.17-18, 2016. 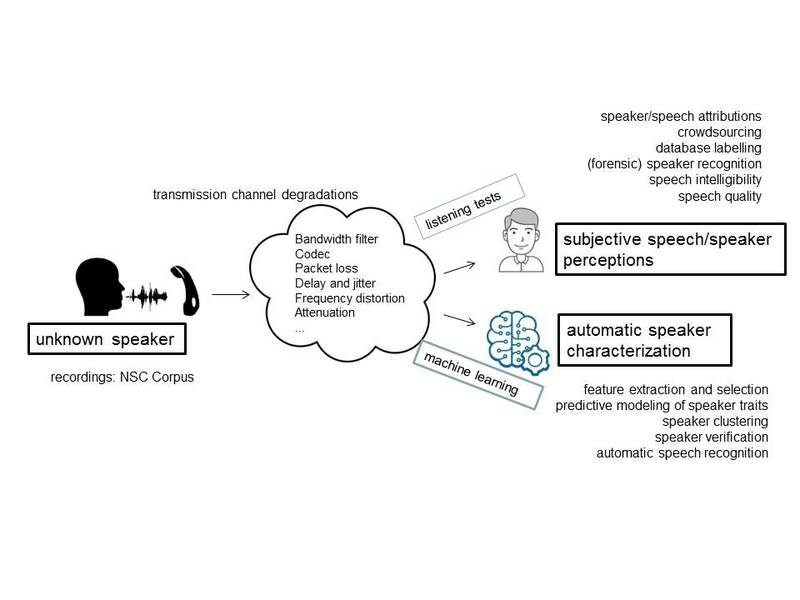 Fernández Gallardo, L., Möller, S. and Wagner, M., "Importance of Intelligible Phonemes for Human Speaker Recognition in Different Channel Bandwidths," Interspeech, pp. 1047-1051, 2015. Fernández Gallardo, L. and Möller, S., "Towards the Prediction of Human Speaker Identification Performance from Measured Speech Quality," Interspeech, pp. 443-447, 2015. Möller, S., Fernández Gallardo, L., and Wagner, M., "Wiedererkennbarkeit von Sprechern bei schmal- und breitbandiger Telefonübertragung [Recognisability of Speakers in Narrow and Broad band Telephone Transmission]," in Proc. 26. Konferenz Elektronische Sprachsignalverarbeitung, Eichstätt, Germany, 2015. Fernández Gallardo, L. and Möller, S., "Phoneme Intelligibility in Narrowband and in Wideband Channels," Annual German Congress on Acoustics (DAGA), pp. 121-124, 2015. Fernández Gallardo, L., "Human and Automatic Speaker Recognition over Telecommunication Channels", PhD Thesis, University of Canberra, Canberra, Australia, 2014. Möller, S., Köster, F., Fernández Gallardo, L., Wagner, M., "Comparison of Transmission Quality Dimensions of Narrowband, Wideband, and Super-Wideband Speech Channels", Proc. 8th Int. Conf. on Signal Processing and Communication Systems (ICSPCS), p. p41, 2014. Fernández Gallardo, L., Wagner M. and Möller, S., "I-vector Speaker Verification for Speech Degraded by Narrowband and Wideband Channels," Informationstechnische Gesellschaft im VDE (ITG) Conference on Speech Communication, 2014. Fernández Gallardo, L., Wagner M. and Möller, S., "Advantages of Wideband over Narrowband Channels for Speaker Verification Employing MFCCs and LFCCs," Interspeech, pp. 1115-1119, 2014. Fernández Gallardo, L., Wagner M. and Möller, S., "I-vector Speaker Verification based on Phonetic Information under Transmission Channel Effects," Interspeech, pp. 696 - 700, 2014. Fernández Gallardo, L., Wagner, M. and Möller, S., "Spectral Sub-band Analysis of Speaker Verification Employing Narrowband and Wideband Speech," Odyssey 2014: The Speaker and Language Recognition Workshop, pp. 81-87, 2014. Fernández Gallardo, L., "Speaker Recognition and Speaker Characterization over Landline, VoIP and Wireless Channels," Doctoral Consortium, International Conference on Affective Computing and Intelligent Interaction (ACII), pp. 665-670, 2013. Fernández Gallardo, L., Wagner M. and Möller, S., "Transmission Channel Effects on Human Speaker Identification in Multi-Party Conference Calls," International Conference on Information Technology in Asia (CITA), pp. 38-43, 2013. Fernández Gallardo, L., Möller, S. and Wagner, M., "Human Speaker Identification of Known Voices Transmitted Through Different User Interfaces and Transmission Channels," International Conference on Acoustics, Speech and Signal Processing (ICASSP), pp. 7775-7779, 2013. Fernández Gallardo, L., Wagner M. and Möller, S., "Analysis of Automatic Speaker Verification Performance over Different Narrowband and Wideband Telephone Channels," Australasian International Conference on Speech Science and Technology (SST), pp. 157-160, 2012. Fernández Gallardo, L., Möller, S. and Wagner, M., "Comparison of Human Speaker Identification of Known Voices Transmitted Through Narrowband and Wideband Communication Systems," Informationstechnische Gesellschaft im VDE (ITG) Conference on Speech Communication, pp. 219–222, 2012. ITU-T Contribution COM 9-389 (2016). Predicting Automatic Speech Recognition Performance over Communication Channels from Instrumental Speech Quality Predictions, Deutsche Telekom AG (Authors: L. Fernández Gallardo, S.Möller), ITU-T SG12 Meeting, 7-16 June 2016, CH-Geneva. ITU-T Contribution COM 12-198 (2014). Operational Quality Estimator: Comparison of Transmission Quality Dimensions of Narrowband, Wideband, and Super-Wideband Channels, Deutsche Telekom AG (Authors: S. Möller, F. Köster, L. Fernández Gallardo, M. Wagner), ITU-T SG12 Meeting, 2-11 Sept. 2014, CH-Geneva. ITU-T Contribution COM 12-42 (2013). Human Speaker Identification Over Transmission Channels of Different Bandwidths and Impairments, Deutsche Telekom AG (Authors: L. Fernández Gallardo, S. Möller, M. Wagner), ITU-T SG12 Meeting, 19 – 28 Mar. 2013, CH-Geneva.